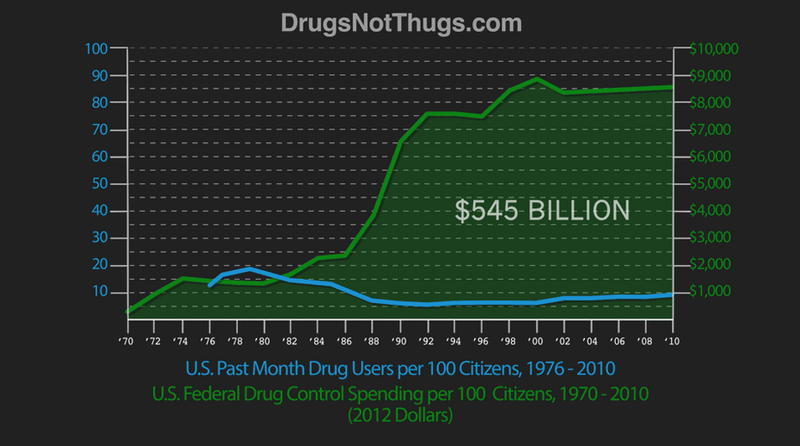 Shallow Cogitations: A Catalyst For Ending The War On Drugs? Both Colorado and Washington have passed respective measures concerning the legalization of marijuana. Colorado's initiative amended the state constitution. The text of the initiative is short and sweet. An amendment to the Colorado constitution concerning marijuana, and, in connection therewith, providing for the regulation of marijuana; permitting a person twenty-one years of age or older to consume or possess limited amounts of marijuana; providing for the licensing of cultivation facilities, product manufacturing facilities, testing facilities, and retail stores; permitting local governments to regulate or prohibit such facilities; requiring the general assembly to enact an excise tax to be levied upon wholesale sales of marijuana; requiring that the first $40 million in revenue raised annually by such tax be credited to the public school capital construction assistance fund; and requiring the general assembly to enact legislation governing the cultivation, processing, and sale of industrial hemp. How ironic that the first $40 million goes to a public schools construction fund. The rule making is now up to the legislature. Washington's Initiative 502, on the other hand, is an example of such rule making. Sixty-four pages of modifications to the Revised Code of Washington. As everyone already knows, federal law trumps state law in this area. Marijuana is listed as a Schedule I drug. Here is what the Controlled Substances Act has to say about Schedule I drugs. The drug or other substance has no currently accepted medical use in treatment in the United States. There is a lack of accepted safety for use of the drug or other substance under medical supervision. There is no leeway in federal law when it comes to a Schedule I drug. The Director of National Drug Control Policy is required by law to oppose the legalization of any Schedule I drug. More than one Federal law enforcement agency is involved in drug enforcement and it remains to be seen what the Obama administration will do in both states as licenses are issued to marijuana producers, production ramps up, and sales are made. 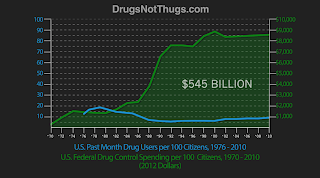 This chart I shamelessly stole from an article on The Atlantic Wire is another conversation starter questioning the effect of the billions we've spent on the war on drugs. Another thing to consider is that the US imprisons more people than any other country and the majority of those prisoners are nonviolent drug offenders. Hopefully, these two initiatives will encourage our federal legislators to address the war on drugs, but I'm not going to hold my breath.